Getting a new cookbook in the mail is my kind of fun. 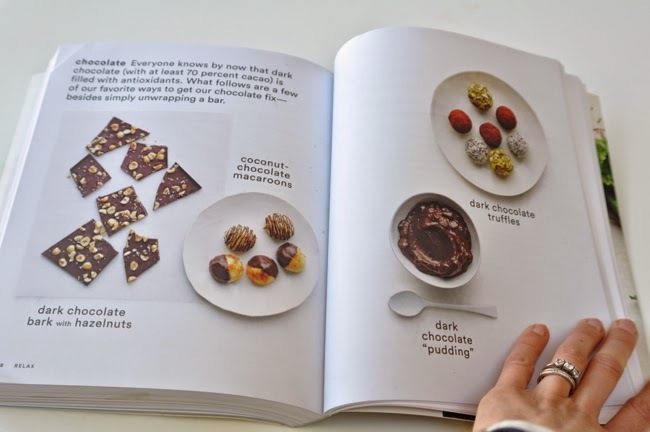 I flip through it right away, bring it into bed at night, start folding down pages, and ultimately create grocery lists for a handful of first choice recipes. We cook and eat those, check out the other folded pages, again shop and cook, slowly eating our way through it. 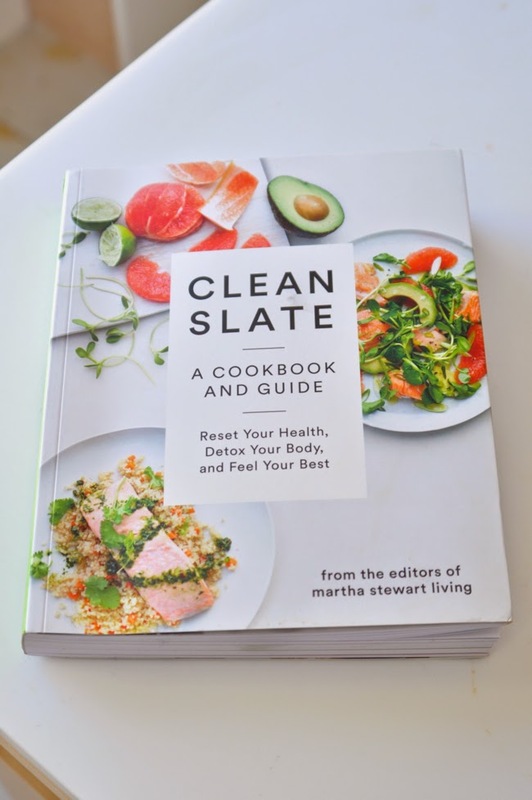 I'm in the middle of a love affair with this new book, Clean Slate, from the editors of Martha Stewart Living, and am giving away a copy. Leave a comment below to enter the drawing and I will pull a name early next week! I can't wait for one of you to bring this home. 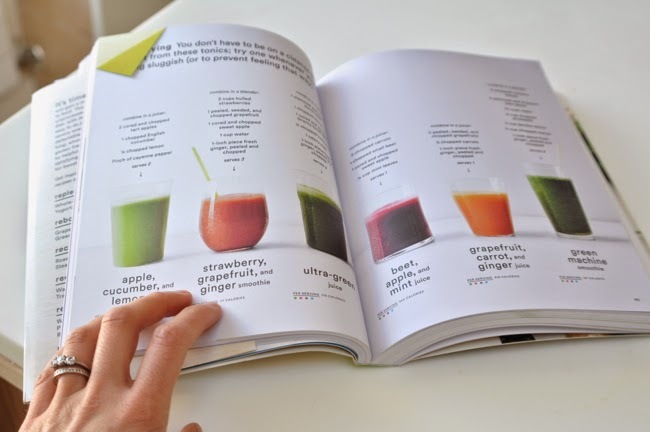 There is so much important information in here from an overview of nutrients (including super detoxifiers, antioxidant powerhouses, inflammation fighters, and digestive aids) to a simple pantry restock approach, and two specific mind/body detox action plans (one is 3 days and the other is 21 days - both come with full menu guides and recipes). Personally, I'm starting with the 3 day detox plan (call it trip prep or snow distraction strategy #99) and really appreciate the ease of it. You just cook three big batch meals (a smoothie, salad, and soup) to enjoy over the 3 days. It's so simple that I may even be able to talk Nick into it. I have at least a dozen recipes dog-eared but started in the kitchen with these two salads and loved both. 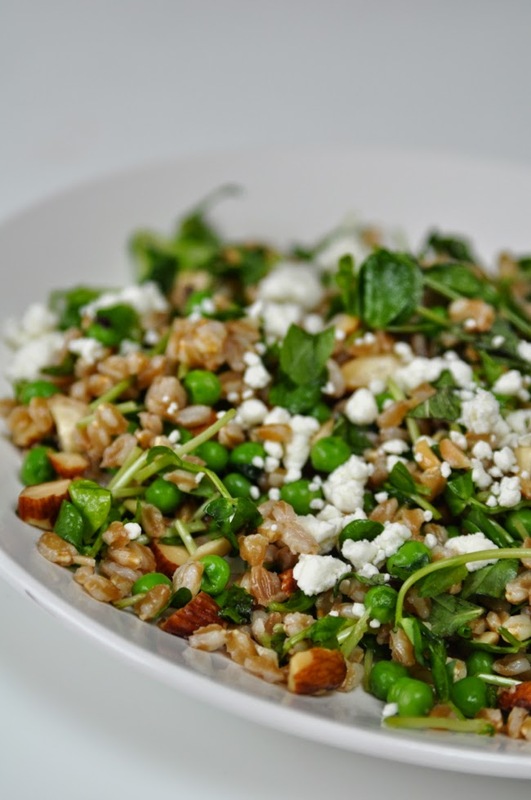 Place farro in a medium saucepan, and cover with 4 inches of water; add a pinch of salt. Bring to a boil; reduce heat and simmer until tender; 30 to 35 minutes. Drain and transfer to a bowl; let cool completely. Meanwhile, cook peas in a small saucepan of salted boiling water until tender, about 2 minutes. Drain and run under cold water to stop the cooking. 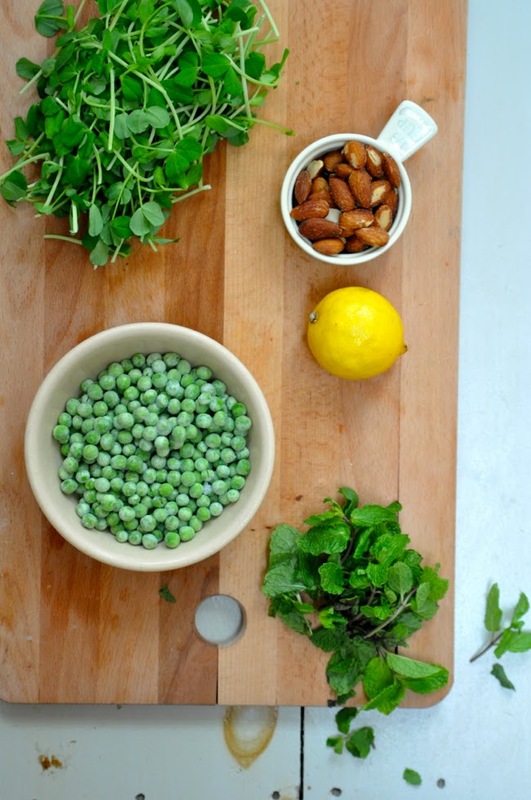 Add peas, pea shoots, mint, almonds, and lemon zest to farro. Toss with lemon juice and oil. Season with salt and pepper. Serve topped with goat cheese. Whisk together lemon zest and juice and mustard in a bowl. Add oil in a slow, steady stream, whisking until emulsified. Season with salt and pepper. Always love your recipes! Would love to win! Love your blog! 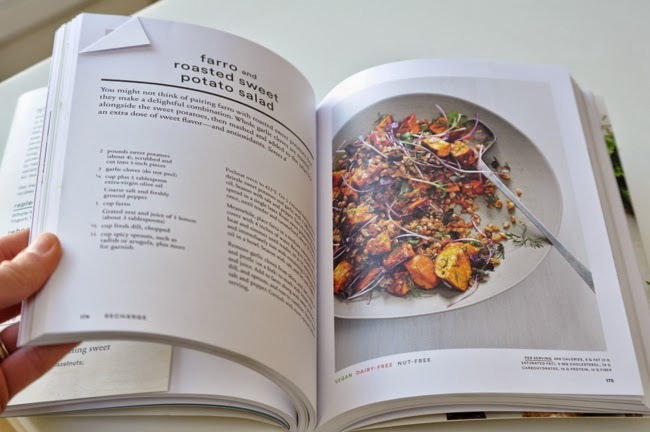 I would be thrilled to win that beautiful cookbook! I love all of your recipes! I make the lemon, kale, almond farro salad all the time! 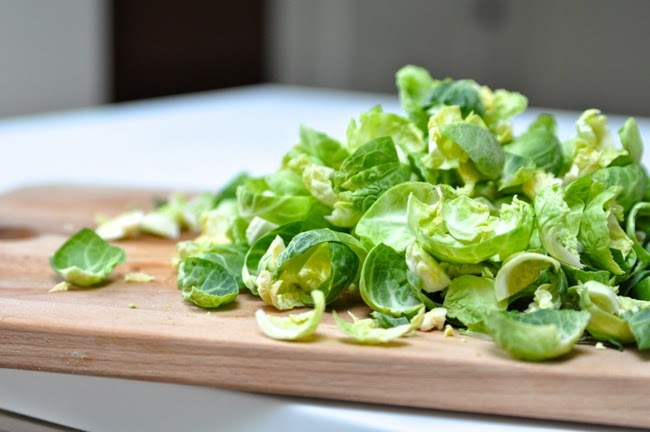 These new ones look great and I'm always looking for creative ways to use brussel sprouts. Love this! Can't wait to get my hands on a copy and to give them out as gifts to family and friends! Congratulations Sarah!! Thanks for sharing -- keep up the great work! These salads look fantastic! Thanks for the opportunity! One day I will have a big kitchen stocked with lots of supplies and be able to make all the delicious food you post. 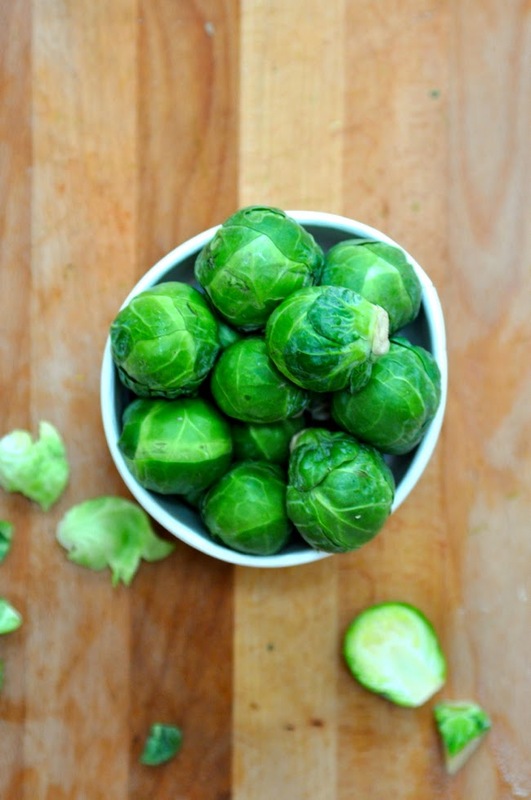 I <3 Brussels sprouts! Love your recipes! We want that book! I adore watching Shira on Everyday Food you tube channel and love her recipes. I have been hearing about this book for a while but had no idea it contained the cleansing plans and digestion info too. Wow! Would be a great resource for my clients too. Yum! I would love to have this! I am def in need of a "Clean Slate!" Looks like a wonderful book to own, thanks for offering a copy. Your recipes are always so beautiful and delicious! I love to cook as well! That sounds like a great cookbook. 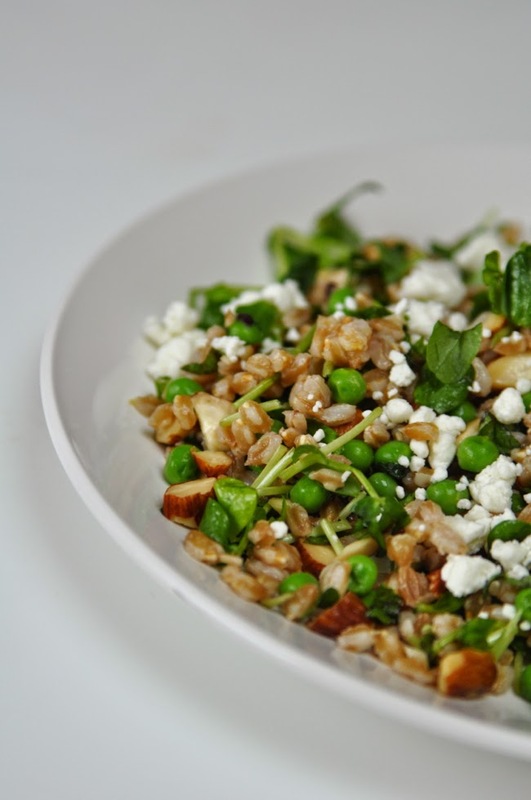 The Farro salad, especially -- I've been wanting to try that out. Love this site - your beautiful photography makes every recipe so enticing! This book looks wonderful. I'm about to make your dark chocolate coconut pudding - A reward after a great January gentle cleanse! Can't wait to see your cookbook! Love these recipes! I could certainly add this book to my arsenal! The cookbook looks great. Seems similar to their old Whole Living magazine. I try to limit the number of cookbooks I own to ones I know I'll reach for over and over again. This ones sounds like a keeper! What a beautiful book! And fantastic recipes! This book will be my favorite! Love your recipes. Thank you!!! well that all looks like a nice and easy reset! have so much fun on your adventure! i wish you a few days with no snow! I have been reading your blog for over 3 years and I still get inspired by it. I do intend to take part in your annual Cleanse at some point this year but this book would be a good addition to my changing lifestyle. You have great taste in food and interior design. Greetings from London. Tessa you won the book! Email me for details! Thank you, Sarah. I am delighted. Emailing you my details now. 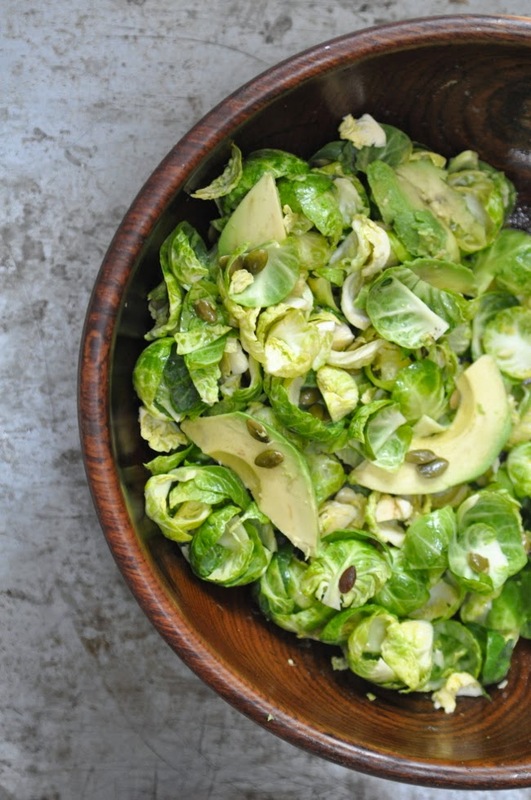 Looks like an amazing salad…and a great cookbook to check out! Hi Sarah, I received the cookbook about a week ago. Going shopping today to try out some new recipes.